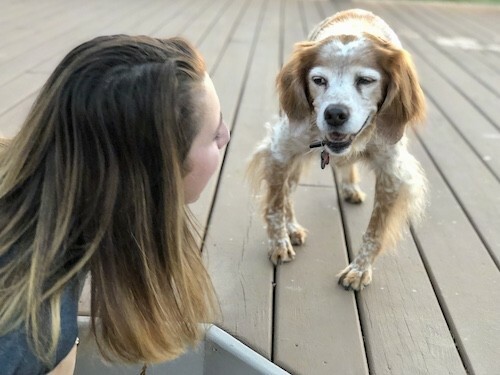 "This is my three-year-old French Brittney Spaniel Miska. He is a very energetic dog and loves to play. His favourite things in the world are his stuffed squeaky toys. 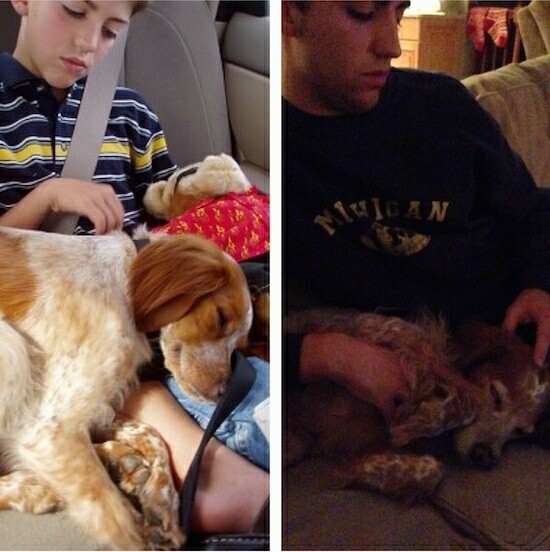 He is the greatest dog we could ask for." The Brittany is not recommended for apartment life. It is very active indoors and will do best with acreage. This breed is resistant to cold and damp conditions. 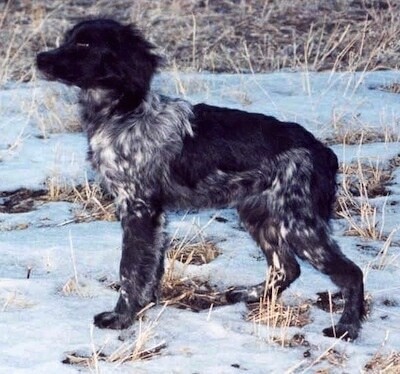 French Brittanys are enthusiastic, active bird dogs. They love to exercise and have great stamina. They need extensive exercise and do best with an active outdoor person or hunter. They need to be taken on daily walks or jogs where the dog is made to heel beside or behind the person holding the lead, as instinct tells a dog the leader leads the way, and that leader needs to be the human. Regular brushing twice a week of the medium-length, flat coat is really all that is needed to keep it in good condition. Bathe or dry shampoo when necessary. It is generally a low-maintenance dog. 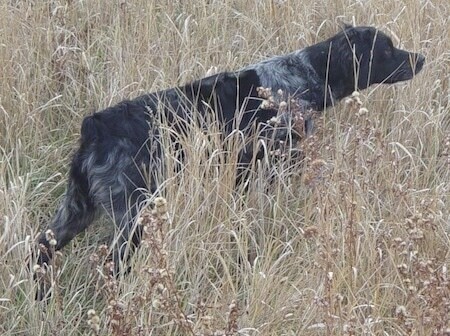 Check the ears carefully, especially when the dog has been out in rough or brushy terrain. This breed is a light shedder. Molly the French Brittany Spaniel eyeing up a squirrel in the tree. Molly the French Brittany Spaniel resting on the couch with her toy. 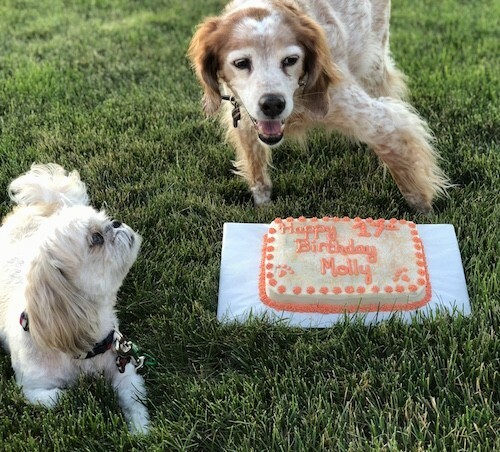 "Sadly, Molly passed away at age 17. Her heart and lungs were strong, but we think she succumbed to a brain tumor. She was healthy until the very end. 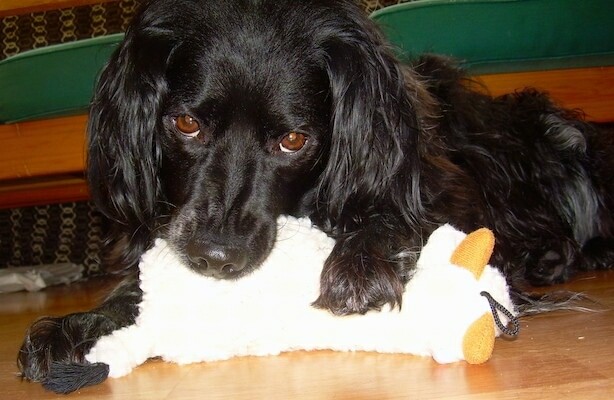 RIP Molly, loved forever." 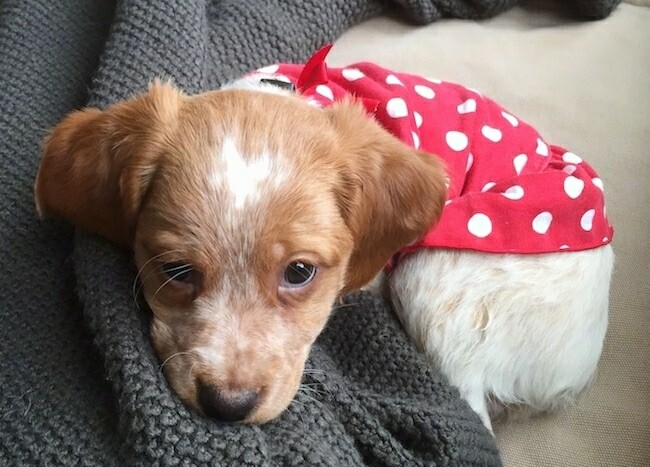 Maddie the French Brittany as a puppy—"Molly and Maddie were both from Plum Creek Kennels and live in Michigan. They are bird hunting dogs and reside in our house. They get along well with our Shih Tzu and teenage children. 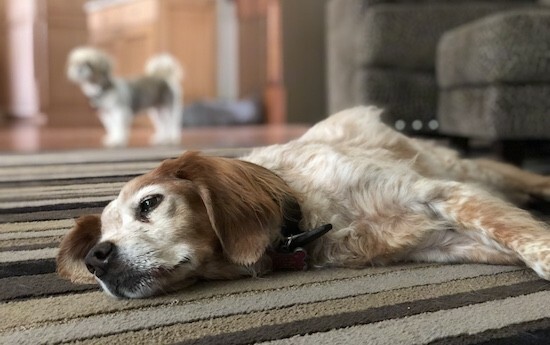 At 14 Molly remains healthy, despite some early cataracts. Molly would never abide crate training, likely because we did not know how to train her. Maddie does well in the crate and needs to be kept there when no one is home as she is still a puppy. Molly was easy to potty train, but the harsh Michigan winter made training difficult for Maddie. Both pointed at a very young age." 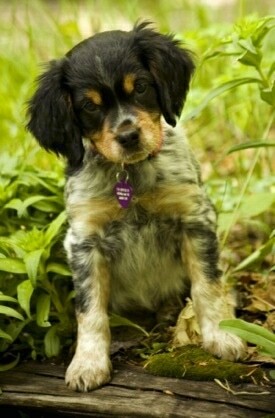 "French Brittany female puppy named Josie loves to hunt and swim. 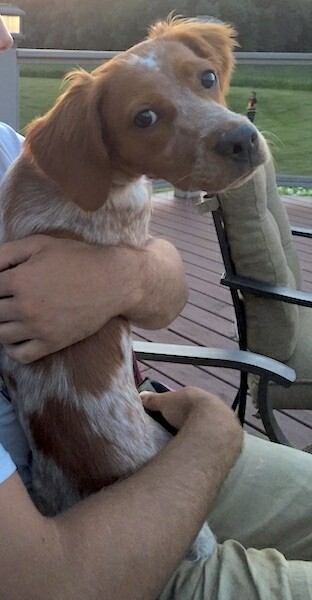 Started pointing the first day we had her. Very quick learner; almost seems she understands what you’re saying. Loves to go for rides in the car, boat and 4-wheeler." 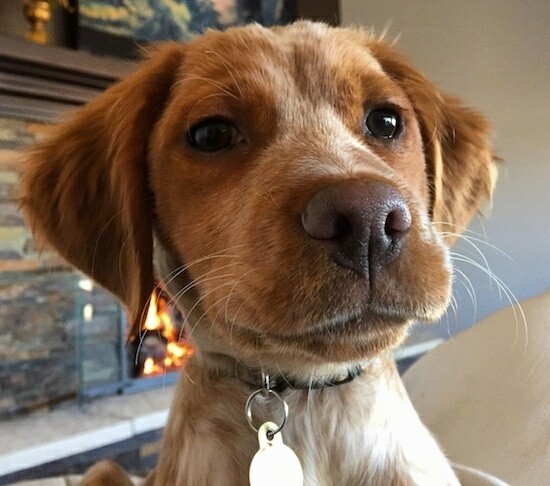 Jake the French Brittany—"This pic shows the breed's intelligence and alertness."